Polystyrene Baubles, glitter balls, and snow balls. Polystyrene Baubles, balls and Snowballs. Our baubles and snowballs are available with a snow effect finish or glittered in one of our wide range of colours, to suit your theme. From 30mm to over 1500 (5 foot ) diameter, there is a sure to be a size that suits. all baubles and balls are produced from a polystyrene containing a flame retarding additive. When applying snow and glitter, we do not use a flammable adhesive. request. The larger baubles have a shaped top (as above) as standard, with a half circle hanging loop. Different shapes are available on request. Click on above images for enlargments. All prices are subject to Packing, carriage and VAT. For an additional charge, balls can be fitted with a hanging point and/or a shaped top. ** These balls are made from 2 hollow halves. the frosted and snow effect versions can be supplied in 2 halves or joined. *These balls are made from 2 solid halves. The frosted and snow effect balls can be joined together at no extra charge. The Plain polystyrene balls can be joined for an additional charge. 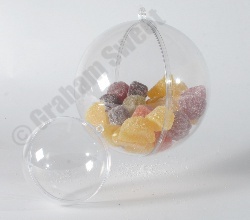 Clear plastic balls, and other shapes are also available.